Leading Manufacturer of dairy industry turnkey project and vertical milk storage tank from Noida. Over the years we have also expanded our repertoire to include turnkey projects for the milk and milk products and other industries. At present, we are doing turn key projects for ice cream industries, milk dairy farms, amongst several others. We are doing turn key projects for milk dairy from 250 lph to 1,00,000 lph capacity as per customers requirement. This product is used for Mini Dairy Industry for Milk, Ice Cream, Fruit Juice and beverages. 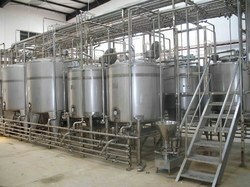 The range starts from 250 LPH onwards.We are doing complete turn key project for Milk processing unit equipment like Cream Separator, SS Centrifugal Pump, Filter, Valves & Fittings, Homogenizes, Hot water generator, Pasteurizer, SS Pipe & fittings, Milk Silos, Ice Bank Tank, Milk Pouching Machine, Cold Room etc. 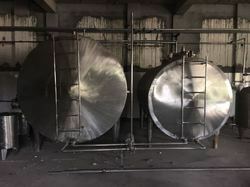 Our organization has successfully expanded its business in market owing to the offered elevated quality array of Vertical Milk Storage Tank that is used to store the milk at desired temperature for longer durations. The tank is provided with insulation in the outer jacket to prevent the temperature dropping. The tank can also be provided with slow speed agitator for regular mixing of the milk. Offered tank is designed by our professionals in compliance with industry quality standards. Our provided tank is manufactured using the latest technology, innovative machines and the finest components. Moreover, it is tested on various stringent parameters to ensure its durability and quality.